Contact a French Sales Engineer for more information about French & TMP hydraulic laboratory presses. French built its reputation on the manufacture of rugged, low-deflection production presses. 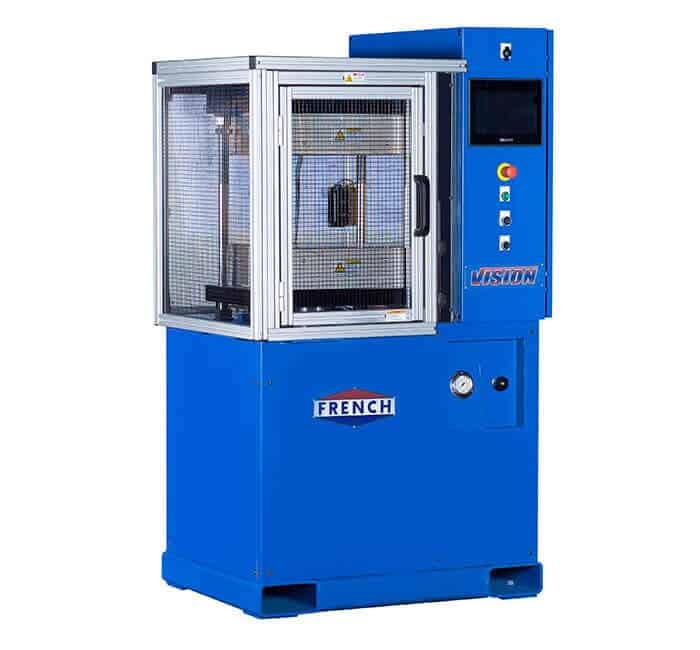 That engineering vision has been applied to the VISION Series of laboratory presses, creating a small machine with the features and durability of larger hydraulic presses. These precision laboratory presses represent an ideal choice for either laboratory/development work or the rigors of regular production. VISION Series presses deliver optimal performance in a diverse array of applications, including R&D work, testing, short runs, limited production, cell manufacturing and lean manufacturing. The column-style laboratory presses feature a double-acting hydraulic cylinder and adjustable daylight. Clamp force, opening speed, closing speed and pressing speed are manually adjustable. The VISION Series offers 30, 50, 75, 100 and 150-ton models, with standard platen sizes ranging from 15″x15″ to 24″x24″. Other platen sizes and custom hydraulic press designs can also be supplied for special applications. 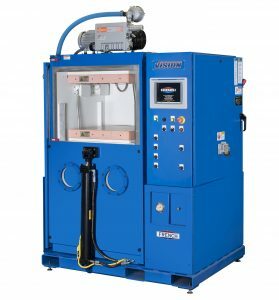 Our combined low-deflection and vacuum hydraulic press design provides a solution for molding critical or difficult parts; especially highly gaseous materials and parts with deep-drawn profiles. The removal of heated gases, trapped air help eliminating voids and defects. This results in higher quality and reduced scrap parts. It also helps reduce harmful eye vapors. For many parts faster production rates are obtained because of reduced bumps (breathing cycles).